Window gel clings are reusable, flexible decorations that stick when pressed onto a glass surface. 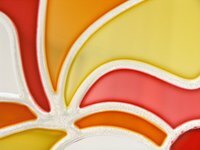 They can replicate stained glass or decorate windows for seasons and holidays. Making your own window gel clings allows you to use your creativity to create original designs, as simple or complex as you like, to express your style and complement the home’s decor. Place the plastic sheet over the design pattern and tape it to the work surface. Outline the design with liquid leading by gently squeezing the bottle to get a small, even line. Allow to dry. Fill in the areas of the design with glass paints up to the edge of the leading. Filling in the areas as much as possible will help the clings to be thick and not prone to tearing. Prick any bubbles in the paint with a toothpick. Allow to dry for three to four days, or until completely dry. Peel the window gel cling gently off the plastic to use on a freshly cleaned window. Thick paint that has the consistency of all purpose school glue works best. It creates a flexible window gel cling that will hold up to use. You can also create your own glass gel paint using a mixture of decoupage glue and acrylic paint. Create gel window clings without liquid leading by pouring the glass paint into a flat, smooth baking sheet. Allow to dry. Pull up the sheet of dried paint and cut out designs with scissors, a craft knife or cookie cutters. “Gardens and Beyond Glass Painting;” Kooler Design Studio; 2001.